The new Volvo Rescue Pump. These appliances have replaced the emergency service tenders and second pumps at most stations across the north that had emergency tender cover. These will soon be second appliances at two pump stations giving advanced rescue cover. Added by Bryan Sweeney on 29 October 2006. Added by on 26 December 2006. The RP in this picture is based at S14 Lurgan which is apparently a Wholetime/Retained station, although I'm not sure if the RP or the WrL is the wholetime appliance. The NIFRS has identified 7 stations which they see as requiring some form of wholetime cover, 3 of these stations, N21 Coleraine, W21 Omagh, & S26 Newtownards all have Rescue Pumps. Added by Bryan Sweeney on 27 December 2006. Added by John on 21 August 2007. Basically what I have been told from a few mates in N21 Coleraine is the way it will work with any of the stations that go day manned/retained and have a rescue pump is whatever the shout is determines which appliance is wholetime manned eg if a rta comes in the whole timers will jump into the rescue pump and the retained guys get the wrl where as if it is a house fire they jump into the wrl and the retained get the rp. Thats the idea but whether that works or not or they change their plans we will see through time. Added by Nial Kirkpatrick on 03 September 2007. Magherafelt was the 1st stn to get one of these RP's. They are by far the best looking appliance in the country! Added by Lee on 20 April 2008. 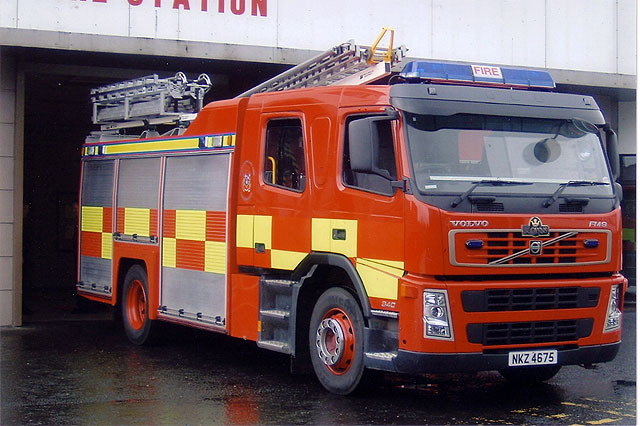 Newry fire station had a rescue tender and lost it to a Rescue Pump. For a city Station with a high number of special service calls this was a huge mistake, and was never discussed with the station crews. I agree that these appliances are fantastic in look and hold a lot of equipment but have a reduced amount of water and will not carry a 135 ladder. They are manned by the wholetime crew should there be an rtc or if they on station area duties, otherwise manned by retained crews. Does anyone have an reservations about these appliances. Added by John Mc Ateer on 10 December 2008.